Chickpeas, also known as Garbanzo beans or Cicer arietinum has many other names like Bengal gram and Indian pea. It is a high protein legume, which is consumed as a staple food in the Middle East and South Asian countries. To give a slight description of the plant of these beans, it grows about 30 to 60 cm in height and consists of feathery leaves. The garbanzo beans are one of those types of beans that are held in a seed pod which includes two peas in it. They are green in color when they are immature, which later turn into yellow, these are the ones used in recipes. The plants for these beans are grown in tropical or subtropical climates, but can be cultivated in temperate surrounding as well. It is known to be one of the healthiest legumes found in nature and thus, is a must in our diet. Chickpeas are a roundish, beige to light green members of the legume family grown primarily in part of West Asia, India, and in the Mediterranean. Most are familiar with chickpeas as either used whole in salads, or ground up to make the popular Middle Eastern dish hummus. Chickpeas also can be ground up and used as a flour called gram flour. They may be used in this fashion to make falafel, or to make a variant of tofu made by the people of Burma. It is usually known as Burmese tofu. Chickpeas are also a frequent ingredient in Italian dishes. They may be used to make pasta and beans. They are often added to marinated vegetables and may be part of an antipasto dish. They may also be recognizable as a staple in three-bean salad, which is comprised of green beans, kidney beans and chickpeas and pickled with vinegar or stored in vinegar and oil. Chickpeas are an excellent nutritional choice. A serving of chickpeas has about 4 ounces (113.39 g) or half a cup has about 17 grams of dietary fiber and 19 grams of protein. They are also considered more digestible than most other beans making them a better choice for people who suffer from excessive flatulence after consuming beans. Chickpeas are considered a starchy carbohydrate and are a great staple for people with diabetes. They do not produce high glucose in the body when consumed. Thus they rate well on the glycemic index. There are actually two forms of chickpeas. The Desi type has a darker color and tends to be smaller. The Kabuli type is more familiar to the American consumer with a lighter color and a softer coat. Of the two, the Desi is considered a better dietary choice, but is harder to find in the US. Kabuli chickpeas are quite easy to find, especially canned. One can hardly fail to notice their presence next to many other varieties of canned beans in most grocery stores. Because they have only a slight flavor, they are excellent for mixing with other ingredients or spices, and make for a healthful addition to a variety of dishes. Chickpeas are a rich source of proteins, carbohydrates, dietary fiber and many essential minerals and vitamins. About 164 gm of chickpeas can give 269 calories, and contain 45 g of carbohydrate, 15 gm of proteins, 12 g of dietary fiber and 4 g fat. The same amount of chickpeas also contains about 44.3 IU of vitamin A, 2.1 mg vitamin C, 0.6 mg vitamin E, 0.9 mg thiamine, 6.6 mcg vitamin K, 282 mcg folate, 70.2 mg choline, 80.4 mg calcium, 78.7 mg magnesium, 276 mg phosphorus, 4.7 mg iron, 477 mg potassium, 2.5 mg zinc, 1.7 mg manganese and a small amount of molybdenum. The nutritional profile of the smaller variety of chickpeas can differ a bit, especially regarding the fiber content. The fiber content of the smaller variety of chickpeas is much higher than the larger or kabuli variety. Similarly, the roasted chickpeas nutritional value can also differ slightly. Presence of so many vital nutrients has made chickpeas an ideal food that can provide numerous health benefits. Much of the chickpeas nutritional benefits can be attributed to the presence of high amount of protein, fiber and the trace mineral, molybdenum. A few of the most well-known chickpeas health benefits are enumerated below. Chickpeas are one of the significant sources of proteins. So, vegetarians can combine it with rice or whole grains to get sufficient amount of proteins. Chickpeas contain both soluble and insoluble fiber. The fiber found in these legumes can lower the level of both total and LDL cholesterol. A high level of LDL cholesterol is considered as a risk factor for heart and cardiovascular diseases. The insoluble fiber found in chickpeas can help to increase stool bulk, which in turn, can help to prevent constipation, and many other disorders of the digestive tract including, irritable bowel syndrome. Another important health benefit of chickpeas is the stabilization of the blood sugar level, which can be attributed to the soluble fiber found in chickpeas. People with diabetes and insulin resistance can be benefited by consuming this high fiber food. Chickpeas also supply a significant amount of magnesium, which is beneficial for cardiovascular health. Deficiency of magnesium can increase the risk for heart attacks and many other cardiovascular diseases. Chickpeas are an important source of folate, which helps to lower the level of the amino acid, homocysteine, high level of which is considered as a risk factor for heart attacks and stroke. Chickpeas can also help to control hunger, due to their high protein and fiber content. This in turn, can prove helpful in managing body weight. Apart from these health benefits, chickpeas can help to detoxify sulfites, which are used as a preservative in prepared foods. Molybdenum found in chickpeas is a component of the enzyme that helps to detoxify sulfites. People sensitive to sulfites, experience a number of serious symptoms like, disorientation and rapid heartbeat. Considering chickpeas nutritional profile, it can be concluded that it is one of the most nutritious foods to have around. Including chickpeas in the diet can not only provide a high amount of proteins, but many other essential minerals and vitamins, which can facilitate the smooth functioning of the different body systems. In some people, eating garbanzo beans produces stomach cramps and the formation of excessive gas. There are a few reasons you may experience this reaction after eating them; consult your physician for the underlying cause. A ½ cup of garbanzo beans fulfills 36 percent of the daily recommended fiber intake for a 2,000-calorie diet. With 9 g of fiber per serving, you may experience stomach cramps from eating garbanzo beans because of the sudden increase of fiber in the digestive system. Ingesting more fiber than your body is accustomed to can cause adverse reactions, such as upset stomach, gas, bloating and diarrhea, according to MedlinePlus. The stomach cramps should subside within a few hours, especially after you have a bowel movement or pass gas. Eating certain foods, such as beans, fruits and vegetables, can increase your chances of developing gas pains. Gas pains can cause sharp pains that come and go throughout the abdomen. Gas pains are the result of trapped gas in the intestines that places pressure against the stomach and intestinal walls. Gas pains are commonly accompanied with stomach bloating. Bloating may cause your stomach to become visually distended, make you feel full and may cause tightness to develop in your lower abdomen. If you develop severe pain in your abdomen after eating garbanzo beans, call your doctor. 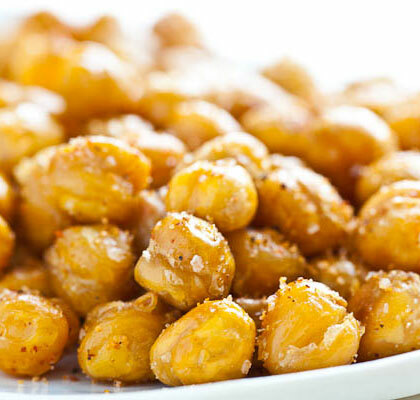 The Cleveland Clinic states that garbanzo beans are a relative of soybeans, which may increase your risk of developing an allergy to chickpeas. If you have a known legume allergy, talk with your doctor before eating garbanzo beans. Not only will an allergic reaction cause stomach cramps, but you may develop diarrhea, vomiting, nausea, stomach pain, skin itchiness, hives, trouble breathing, coughing, a high-pitched sound when you breathe, nasal congestion and headaches. An allergy to garbanzo beans can lead to a severe allergic reaction that can cause life-threatening symptoms, so seek emergency medical care. If your stomach cramping gets worse and is accompanied with a fever, body chills and excessive diarrhea, you may have food poisoning. Food poisoning occurs whenever a food is contaminated with toxins, bacteria or parasites. Food poisonings has no cure aside from rest, drinking more liquids and implementing a bland food diet.